Home social science JLU School of Humanities and Social Science hosts National Seminar on "Good Governance: Engaging with a Policy Metaphor"
JLU School of Humanities and Social Science hosts National Seminar on "Good Governance: Engaging with a Policy Metaphor"
Since the launch of the ‘good governance’ discourse, it has been striking to see how in virtually no time the term ‘governance’, retrieved from a lingering, obscure existence, became a household word figuring on top of the list of concerns of aid agencies, governments, researchers and the media. Albeit, it rapidly appealed to the imagination of analysts as well as practitioners and became a focal point for intellectual as well as for policy discourses. 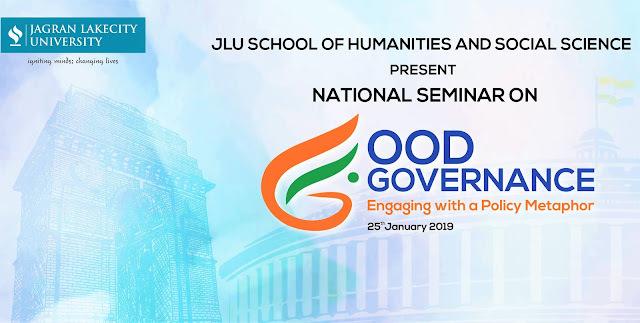 To define the parameters and dimensions of good governance, to identify the major existing lacunas in the universe of governance and prepare a better roadmap for the future, JLU School of Humanities and Social Science organized a National Seminar on "Good Governance: Engaging with a Policy Metaphor" on 25th January 2019. It is evident that even as far as the literature on good governance discourse is concerned, one finds two well-established bodies of literature; democratization literature and development literature. Scholars in the first camp frequently focus on the relationship between democracy and economic performance; whereas researchers adhering to the second camp often attempt to establish the link between good governance and sustainable economic and social development. However, both groups fall short of systematically linking the effect of democracy on good governance. Primarily focusing on India, the seminar also intended to focus on this gap by examining whether democracy and democratization lead to more responsible and effective governance. Along with intended to dwell upon the question as to whether a state’s move toward democracy immediately triggers improved governance practices. The seminar was honoured by the presence of reputed IAS officers, Shri Sheo Shekhar Shukla and Shri Ajit Raizada. The motive of the seminar was to give participants a more holistic idea about the world of governance and to bring about awareness regarding the importance of good governance in a democracy also to identify the initiatives taken in the field.